This is not the last time you will see Fess featured on this site. 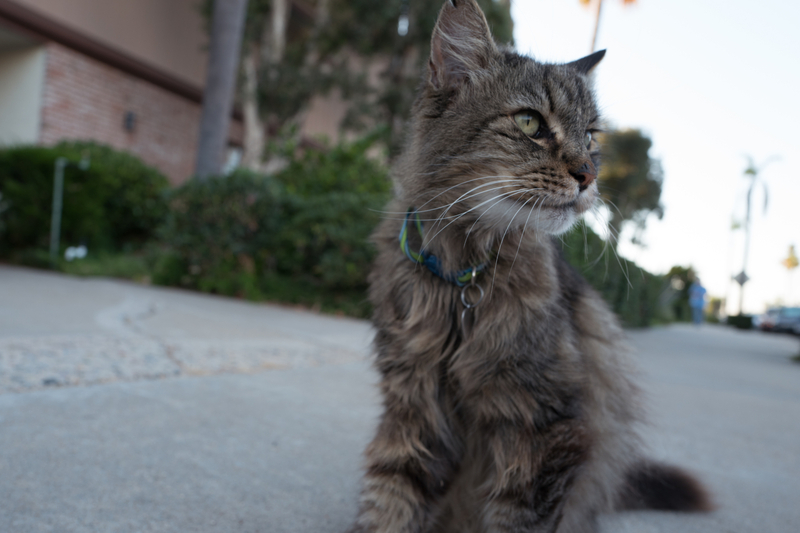 He is my favorite neighborhood feline, and he could be eldest, having been with his owners for 13 years (but he is older). We first met on July 27, 2013, as I rode my then newly-acquired Guerciotti bicycle down Cleveland Ave. 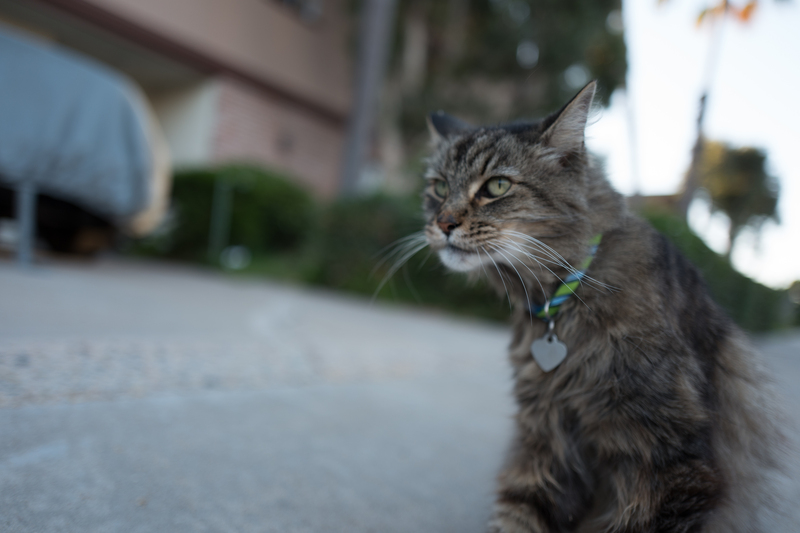 In November 2016, he appeared in my Cats of University Heights series. Last night, we visited briefly during an unusually late sighting. Fess typically goes indoors when his owner comes home from work. In the next yard, Levi and Pepe hung out, too. I shot the Featured Image at 7:21 p.m. PDT, or about 30 minutes before sunset. Fess sat in his driveway when I walked past, paying me no attention and demanding none for himself. I moved a few meters more before deciding to turn back for a quick portrait. 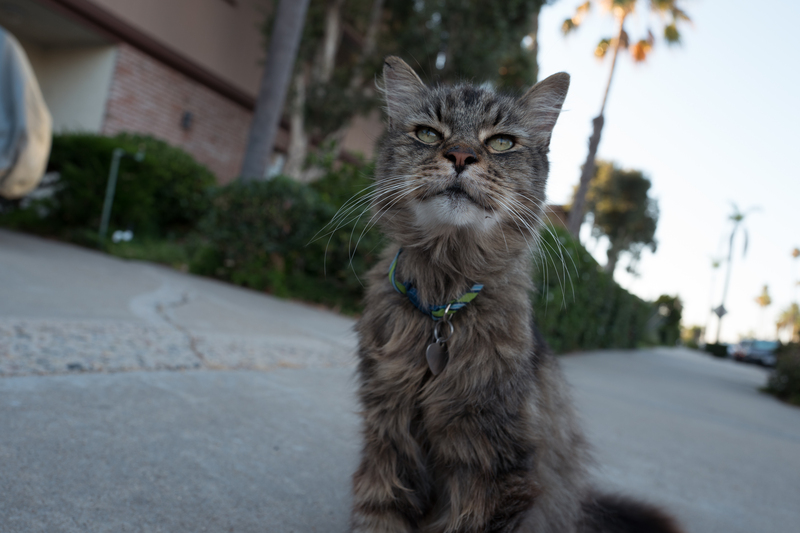 I lay down on the sidewalk for better vantage point, which of course would rouse the cat my way—nudging against my face and looking for pats. The first capture was all auto. Vitals: f/1.7, ISO 100, 1/400 sec, 28mm. I chose the primary photo for composition and for what it spotlights. Fess is not in the plane of focus—well, his body and fur aren’t. But those whiskers as viewed to the right most certainly are crisp and clear. Leica Q delivers surprisingly shallow depth of field, and I think this portrait is fine showcase example. That differs from the alternates directly above and below, for which I changed the aperture to f/5.6. Bokeh still is excellent, even with wider depth of field. ISO is 160 and 125 for each, respectively, and shutter 1/60 sec for both.